What intellectual influence, if any, have British public administration scholars had on their American counterparts since World War II? In this article, the author briefly reviews the major areas of theory and research in the British study of publication administration, further identifying important contributions by British scholars in the areas of modernist-empiricism, the new public management, regulation, policy networks and governance, and interpretive theory. 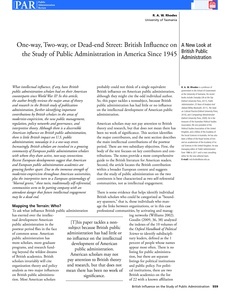 Although there is a discernible American influence on British public administration, there is little British impact on U.S. public administration; nowadays it is a one-way street. Increasingly, British scholars are involved in a growing community of European public administration scholars with whom they share active, two-way connections. Recent European developments suggest that American and European public administration academics are growing further apart. Due to the immense strength of modernist-empiricism throughout American universities, plus the interpretive turn to a European epistemology of "blurred genres," these twin, traditionally self-referential, communities seem to be parting company with an attendant danger that future intellectual engagement may be a dead end.